Resources and activities include free credit reports and one-on-one credit counseling, a career fair, workshops focusing on work readiness and small business resources, adult education services and GED information, financial education tools and products on the BB&T Bank Bus, and HIV testing. This event also features free food, door prizes and ample parking as well free bus tickets donated by TARC that will serve as some of the door prizes as well as distributed in advance to assist residents interested in attending the event. Sponsored by BB&T, the “Be Empowered” event brings together partner agencies at the Nia Center including the Office of Financial Empowerment — part of Louisville Metro Office of Resilience and Community Services, Louisville Forward, KentuckianaWorks’ Kentucky Career Center, and TARC along with Apprisen, Bank on Louisville, Cardinal Success Program, Jefferson County Clerk’s Office, Job Corps, Keeping It Real Neighborhood Institute, Louisville Asset Building Coalition, Louisville Metro Human Relations Commission and My Chosen People.The Career Fair will be held at the Kentucky Career Center on the first floor between 10 a.m. – 2 p.m. including more than fifteen employers from the public and private sectors. Job seekers are encouraged to bring a photo ID and copies of a resume or work history and come dressed to meet employers. Pre-register online at https://focuscareer.ky.gov/careerexplorer/home or arrive early to register and even print your resume. For assistance preparing a resume in advance, visit the Kentucky Career Center at the Nia Center, 2900 W. Broadway Suite 100, or at 600 West Cedar. Also featured will be the BB&T Bank Bus between 10 a.m. – 3 p.m. a 40-foot mobile classroom providing credit report education, unclaimed property searches, self-file income tax preparation stations, as well as comprehensive financial services. BB&T personnel will also be available to help with checking and savings accounts and other financial services and provide access to computer-based Money Smart Financial Education. 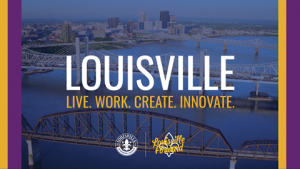 Credit as an Asset 11 a.m.
Opioid Crisis and the Community 12 p.m.
Educational Training Opportunities 1 p.m.
Louisville Metro Certification 1 p.m.
Small Business Resources 2 p.m. Participants at the May 10 event are encouraged to share their experiences and photos on social media using #NiaPower. For more information, call 574-7303 or 574-5168, or download this event flyer.